Winning the fifth Super Bowl of the Kraft/Belichick/Brady Era may seem like old hat by now, but there's no denying Super Bowl LI provided its fair share of historical moments that will stand the test of time. Whether or not it was Tom Brady becoming the first-ever quarterback to win four MVP awards, or the Patriots becoming the first-ever team to erase a deficit of 19 or more points in a postseason game, or the fact that it was the first time a Super Bowl ever went to overtime, there's one singular thread that allowed all of them to happen. And it was Julian Edelman's circus catch. Down by eight with 2:38 on the clock, Brady fired a pass over the middle to Edelman in triple-coverage. 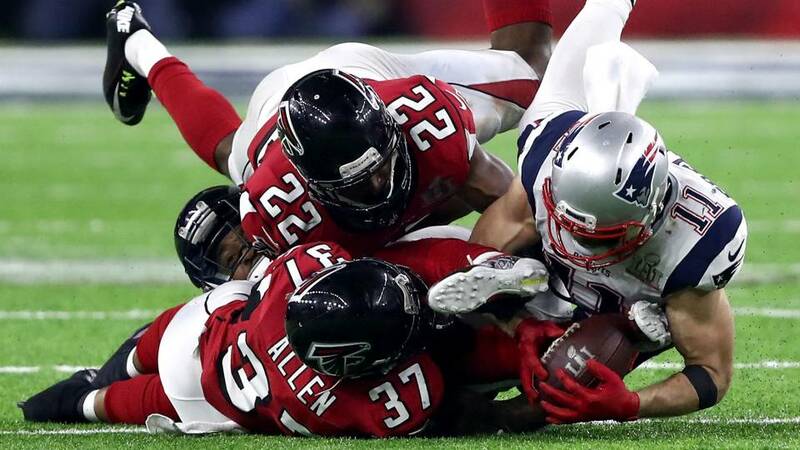 After Atlanta's Robert Alford narrowly missed an opportunity to come up with an interception, Edelman snagged the ball, momentarily lost control of it, yet regained control before the ball could touch the NRG Stadium grass. Absolutely incredible. The Falcons challenged the catch, but all it really did was give us more chances to admire it. The play immediately drew comparisons to David Tyree's helmet catch from Super Bowl XLII -- even the Fox broadcast aired it moments later -- but this catch was much better. Less than a minute-and-a-half later, James White scored his second touchdown of the game. The Pats were able to wholly erase what was once a domineering Falcons lead. Throughout the history of Boston sports, a number of instantly-historical moments have been established. Bobby Orr's Stanley Cup-winner in 1970. Carlton Fisk's walk-off off the foul pole in 1975. Larry Bird's Heat Game in 1994. Adam Vinatieri's clutch kicks. These are just to name a few. Edelman's catch will now join that pantheon, and deservedly so.